I'm pleased to announce the reprint release of my long out-of-print book The Astrological Moon, which has been hard to come by for some time. Throughout her astrological career, Darby Costello has been watching the progressed Moon as it moves through the signs and the houses of the birth chart. 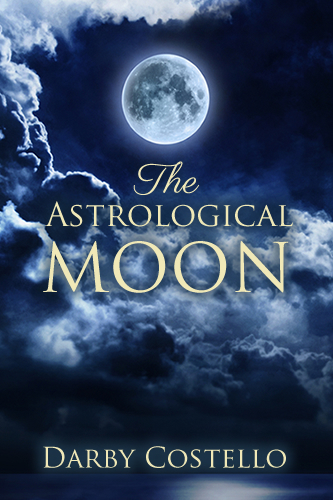 This book contains edited transcriptions from two CPA seminars - one exploring the Moon in its relationship to the natal Sun and the other exploring the progressed Moon, by sign and house, as it describes the unfolding of our emotional life which leads us to the awakening of our souls. In addition, Darby traces the cycle of the progressed Moon as it interweaves with the Saturn cycle, marking moments where crisis and change become gateways to new dimensions of experience. These gateways bring past and future together, and provide openings to the points of intersection between time and eternity that dwell in each of us. Darby writes, "The natal Moon describes the physical gateway through which each of us must enter if we are to have a life on this planet. So far no one has discovered another way to get onto this very colourful little planet, circling its own medium sized star. To spend any time here, as far as we know, you have to enter through a woman's body. And that woman's body will contain traces of every event that has happened since the very beginning . . . All of the past will be contained in that body . . . everything, going back to the birth of the universe."